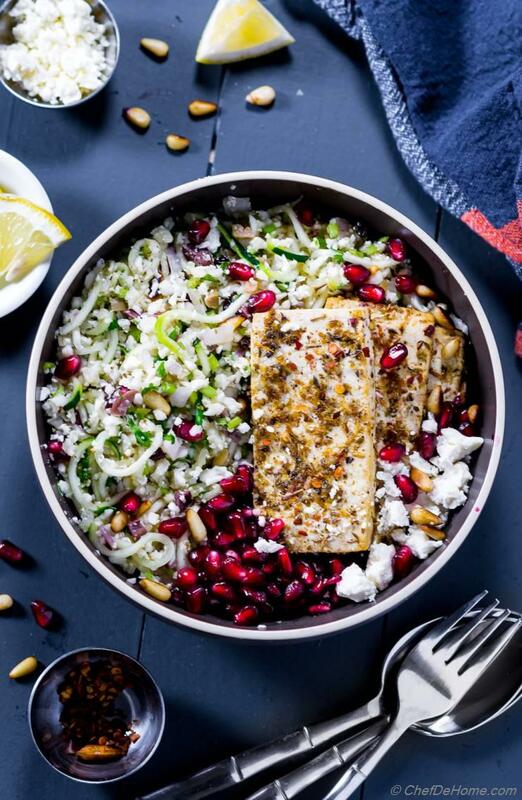 Are you craving a savory Cauliflower Salad or Greek Tabouli Salad? This recipe gives you both. Keeping up with resolution with meatless low-carb Cauliflower Tabouli Salad and Tofu Souvlaki Bowl. Gluten free, low-carb, and vegetarian. This delicious bowl is perfect for meatless Monday and it comes together under 25 minutes. Also, can be made at-least 2 days ahead. Oh, this salad can also be vegan. Just skip feta cheese. I recommend serving Almond Yogurt Taztziki Sauce on side. In this season, two of my favorite recipes are often on my dinner. Chicken Souvlaki with Quinoa Tabbouleh with side of Tzatziki sauce. A winner chicken dinner every time! Today's recipe, I re-discovered my favorite combo's complete vegetarian and lowest-carb version with Cauliflower Tabbouleh and Tofu Souvlaki. I must mention that this recipe is actually two-in-one. It is a marinated raw Cauliflower Salad (my fav) plus a Tabouli Salad. Either way you will find it very delicious. My favorite is how savory ingredients keep every fork-full worth digging for. Yumm! A veggie dish becomes regular in our kitchen when Vishal likes it too. This one, I even packed some for him for lunch. 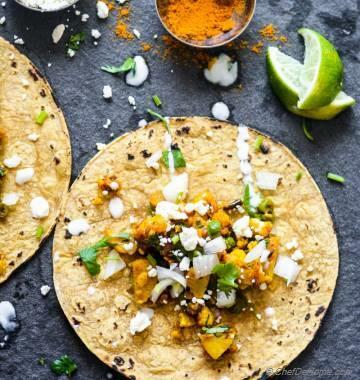 A meat-lover eat a complete vegetarian (and healthy) meal is total "score" in my book. Isn't it? What do you say? Tabbouleh or Tabouli is Greek Bulgar salad loaded with fresh herbs, veggies and delicious dressing. It is something I can never have enough. Lite, lean and low-carb with tons of flavor. That's the magic of Tabouleh. I mean, my cauliflower tabbouleh. Let's first talk about Cauliflower Tabbouleh. 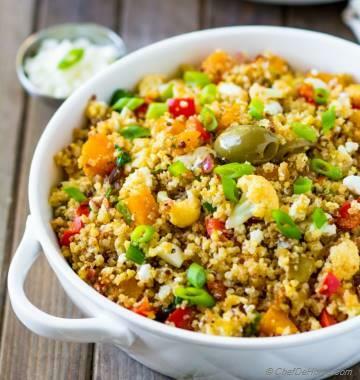 The processed cauliflower mimics the grain-size of fine Bulgar wheat which is used to make traditional tabbouleh. 1) It will get mushy and will loose it's texture. 2) It tastes better raw. The tabbouleh dressing marinates the raw cauliflower making it perfect to eat raw. No cooking required. Texture of cauliflower for tabbouleh is finer than cauliflower rice. You can say, one or 2 more pulses that cauliflower rice will be perfect. 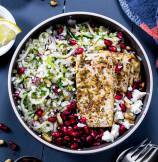 We replace the main ingredient with cauliflower, but it is still a loaded Tabouli salad showcasing all the ingredients which make Tabbouleah special. Other than classic salad ingredients, cucumber, red onion, parsley, and mint. I also like to add some chopped raisins, olives, and toasted pine nuts... And a final finish with delicious garlic, lemon, oregano and olive oil dressing. You can also add chopped cheery tomatoes, and diced carrots if you prefer. Any veggies that can be eaten raw can be loaded in this salad. Also, I highly recommend adding raisins and toasted pine nuts wit touch of feta. 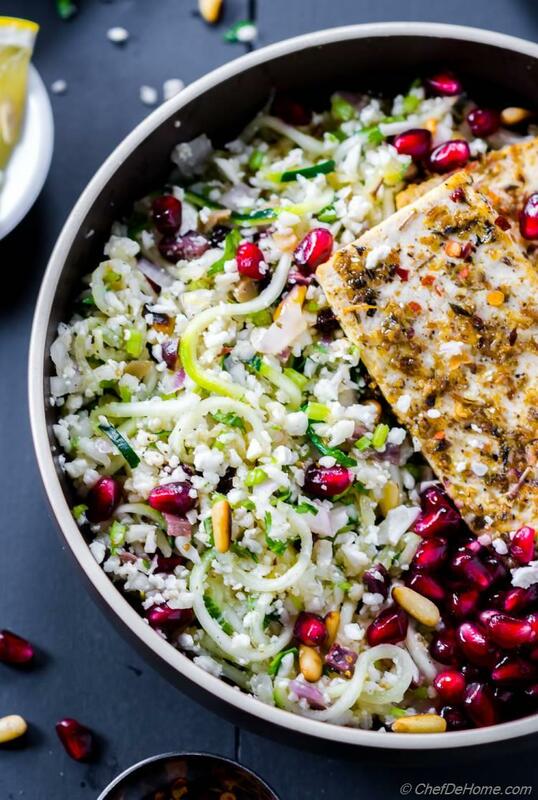 This is what makes this salad fabulous even without Bulgar. Note: To get perfect cauliflower tabbouleh texture without being mushy... always pulse the harder inner stems of cauliflower and florets separately. Usually cauliflower rice get mushy when stems are processed with florets. Stems take longer to get right texture and florets get very fine chopped in meantime. 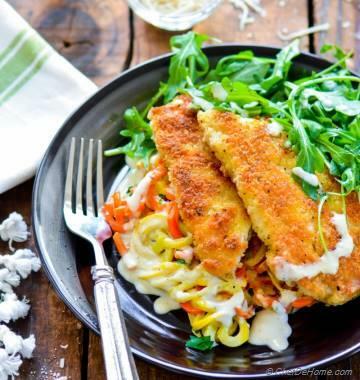 This recipe also showcase the use of our favorite "food processor". Don't forget to check other recipes. Red Curry Paste, Green Curry Paste, Yellow Curry Paste, Salsa Verde, and Cauliflower Mash. This is my vegetarian take of Chicken Souvlaki. I used extra firm tofu for this recipe. 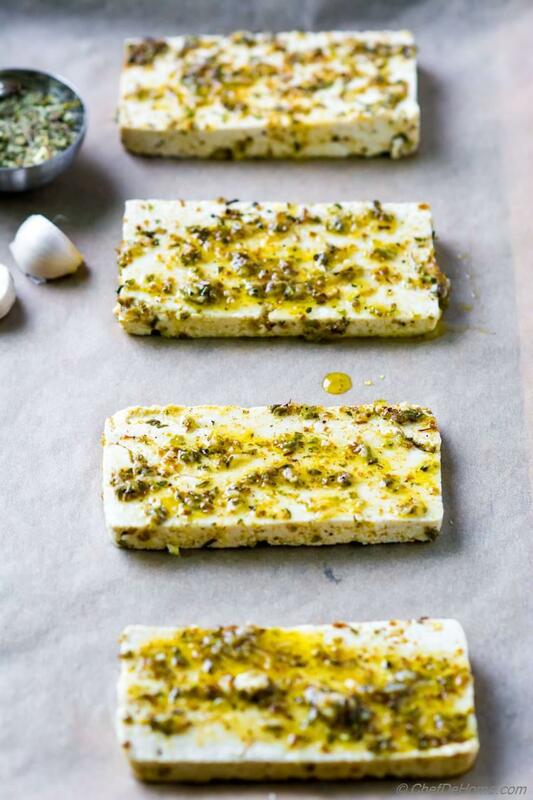 Here is the best part, the marinade used for making tofu souvlaki also works as dressing for tabbouleh salad. I press tofu to drain water. Then, slice it thin and coat in marinade. Leave overnight to absorb flavor. If overnight is not an option, I at-least give it 30 minutes. For baking tofu, I take it out of marinate, place on sheet pan and bake. While tofu bakes, I use the remaining marinade to make tabbouleh dressing. Note: If you are looking replace tofu with chicken, I recommend checking my Chicken Souvlaki recipe. I hope you had great weekend. Oh, did anyone watch Golden Globe last night?! What is your favorite movie from 5 nominees? I have to admit, I have not watched any one of 5. All those are in my to-watch-list.. Specially, The Post and The Darkest Hour. Don't forget to follow us on Instagram @savitachefdehome for all the stories and behind-the-scene action for this month's resolution - South Beach Diet. 1. Preheat oven at 450 degrees. Press tofu for at-least 10 minutes to drain water. 2. Rough chop cauliflower and process in food processor. Season with generous pinch of salt. Transfer to strainer and set aside to drain water. In meantime, chop rest of the ingredients. Spiralize cucumber(if planning to) or dice. Once drained, press cauliflower and cucumber gently with paper towel to remove extra moisture. 3. Mix souvlaki marinade ingredients in a bowl. Chili flakes, 2 tablespoon of lemon juice, a 1.5 tablespoon oil, minced garlic, and oregano with generous 2 pinches of salt and pepper. Mix well. Add tofu, coat well and set aside. You can also marinate tofu overnight. 4. Transfer marinated tofu onto baking sheet. (reserve remaining marinade) Sprinkle with sea salt. Bake at 450 for 12-13 minutes or until firm and slightly golden at top. Keep an eye after first 10 minutes. Once done, set aside to cool slightly. 5. In a wide bowl, in remaining marinade, add remaining olive oil, lemon juice, zest, diced red onion with generous pinch of salt and black pepper. Mix well. Taste and adjust if it needs more lemon juice. Mix in chopped olives, cucumber, cauliflower, with chopped raisins and herbs. Toss well. 6. 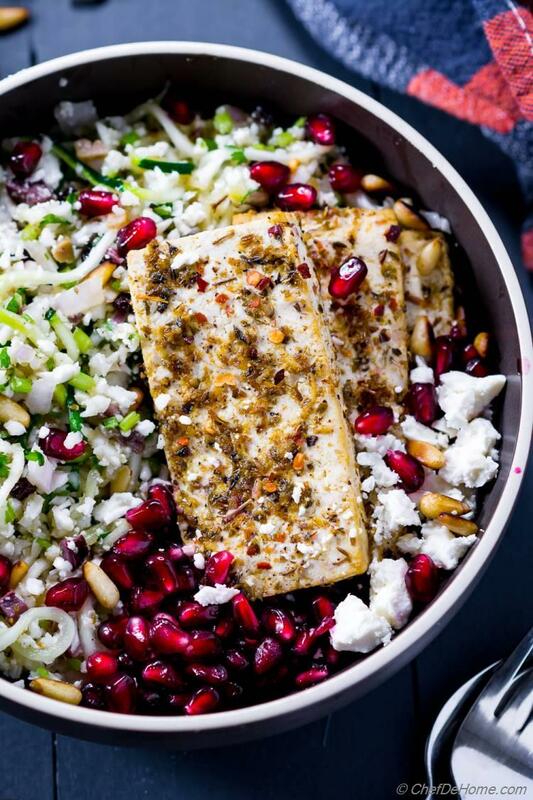 Top with tofu souvlaki, toasted pine nuts, crumbled feta cheese, and pom seeds. Serve and enjoy.